The elegant, three-masted barquentine, Mary Anne, takes passengers back to the era of Darwin and the Beagle itself as she navigates around the archipelago under full sail. 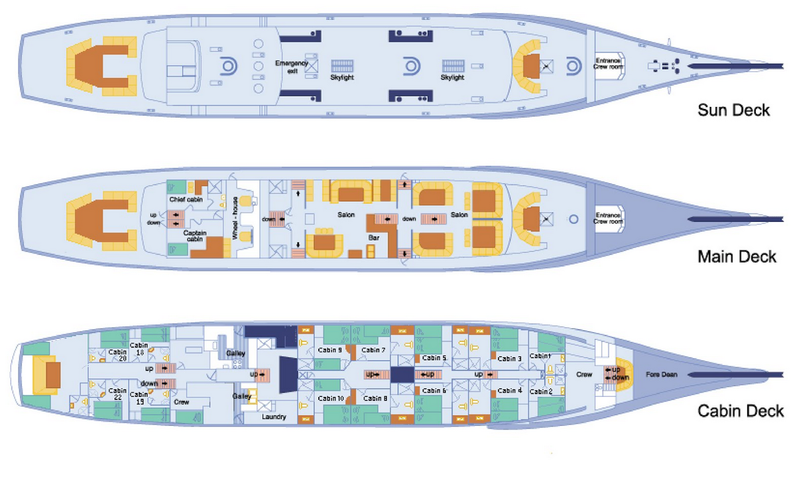 Up to sixteen passengers are accommodated in the ship’s twelve double cabins, making it an ideal option for the individual traveller as there is no single person surcharge. The smart cabins are comfortably furnished, and all have a private bathroom. The rich wood paneling and brass fittings of the ample saloon are further echoes of a more elegant, bygone era while the spacious sun deck and alfresco dining area are charming places in which to relax as the ship slips silently through the water. Unique activities on this Galapagos cruise include sailing lessons, a nautical knots contest and learning how to navigate by the stars. The ship operates under sail for most of the time so affording better opportunities for dolphin and whale watching as there is no motor noise to scare away these naturally curious creatures. 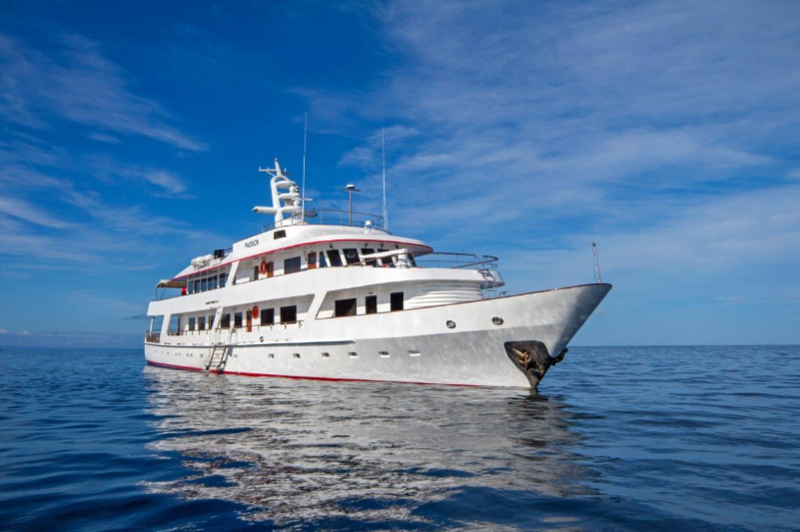 The Mary Anne offers two eight-day itineraries around the Galapagos Islands – one to the West and one to the East of the archipelago. 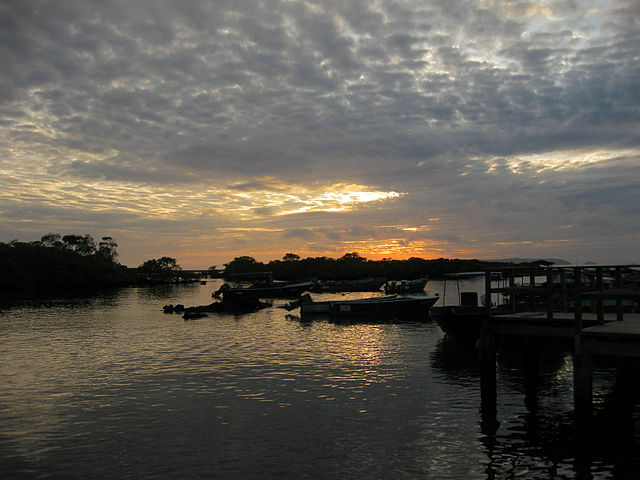 Your Galapagos cruise begins on Baltra, a small island that is home to the archipelago’s main airport. 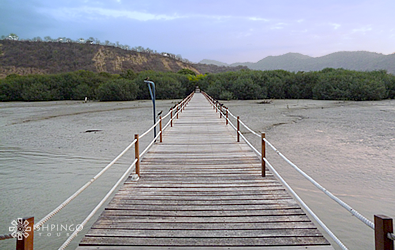 Baltra was used as a U.S. military base in WWII and is now a base for Ecuador’s armed forces. Visitors may take comfort when arriving at the airport, seemingly out of place in so precious and fragile an environment, that it is the first ecological airport in the world designed to reduce impact through energy saving programs, rain water recovery systems and extensive recycling. There is no real chance to see the island as upon arrival you will normally be met by an English-speaking guide who will whisk you to the nearby port where the boat will be waiting to start your Galapagos cruise. 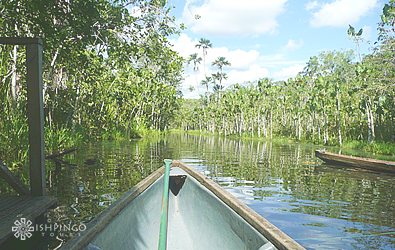 Some cruises start from San Cristóbal and there a variety of options available for land based tours. For many, Santa Cruz is simply a hopping off point on the way to other parts of the archipelago and a way to be connected to the modern world. A little time on the island reveals, however, that it is a destination in its own right with many interesting visitor sites and much to commend it. This island is a must by either Galapagos cruise or by land tour. One of the most notable of these is the Charles Darwin Research Station, where much of the specialized conservation work and scientific research for the Galapagos are conducted. The best known of these is the captive breeding program for giant tortoises, but the station's broad brief also includes monitoring and control of invasive species, restoring populations of land iguanas and the distinctive opuntia cacti as well as publication education. The station's Van Straalen Hall Visitors Centre is part of that education programme and provides a useful introduction to the Galapagos and its physical and living environments and the issues that the archipelago faces. Though it houses the largest human population in the Galapagos, the small port town of Puerto Ayora is a tranquil spot in which to while away some time after enjoying time at sea on a Galapagos cruise. The large choice of hotels, bars and restaurants often comes as a surprise to visitors, as does the number of animals and birds that have made the town their home, going about their business seemingly oblivious to the human activity around them. The island is good for exploring the different types of vegetation that can be found in the archipelago: from the coastal arid zone populated by Palo Santo, mesquite trees, opuntia and candelabra cacti to the lush highlands where forests of scalesia are often shrouded in mist and rain. Here, trees drip atmospherically with water and beard moss while orchids, ferns and bromeliads proliferate. These varied environments give rise to the highest bird tally of any of the islands, with many rare and distinct species to be found. Birders and botanists alike will delight in the opportunities that Santa Cruz affords. The curious group that settled on Floreana, including a nudist vegetarian with metal teeth and a self-styled baroness who named herself the Empress of Floreana, may have left an intriguing tale – their environmental impact, however, was something of a disaster. Introduced animals such as pigs, goats and donkeys, resulted in the loss of giant tortoises, land iguanas and ground finches while Galapagos hawks were hunted to extinction. In 1793, at what became known as Post Office Bay, homesick British sailors placed a large wooden barrel in which they left letters in the hope that other passing seafarers would take them and deliver them once home. The system clearly worked as it remained in use for over a century. Visitors maintain the tradition today by leaving cards and letters for family and friends while also sifting, through the pile, to take a letter or two back home. Tradition also has it that the letter must be hand delivered. Aside from human social history, Floreana is a very popular Galapagos cruise stop and offers one of the best opportunities in the archipelago to see the striking greater flamingo. Just off Punta Cormorant lies the Devil’s Crown, a sunken volcanic cinder cone around which is to be found some of the best snorkelling in the islands. Although the largest island in the archipelago, Isabela is a relatively young 1 million years old. It was formed by the uplifted lava flows from six major shield volcanoes: Ecuador, Wolf, Darwin, Alcedo, Sierra Negra and Cero Azul. 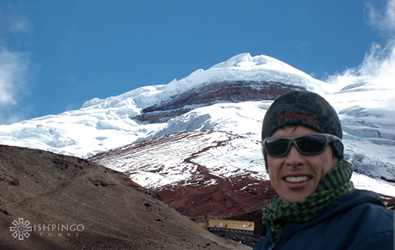 All except Volcán Ecuador remain active, making Isabela one of the most volcanically active places on earth. The most recent eruptions were: Wolf in 1982, Cerro Azul in 1998 and Sierra Negra in 2005. There are a number of species endemic to Isabela including the world’s only surviving population of mangrove finch. 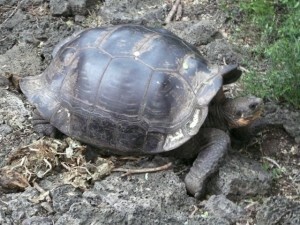 The island's topography has allowed giant tortoises to evolve into distinct sub-species and, indeed, Volcán Alcedo is home to the largest population in the Galapagos. Unfortunately, the stately reptiles must compete for the limited foodstuffs available with a population of some 50,000 or more feral goats. The island's only town, Puerto Villamil, is located at the southeastern tip of the island and is the archipelago’s third largest human settlement. This sleepy little village of pastel coloured houses is situated on an attractive white sand beach. 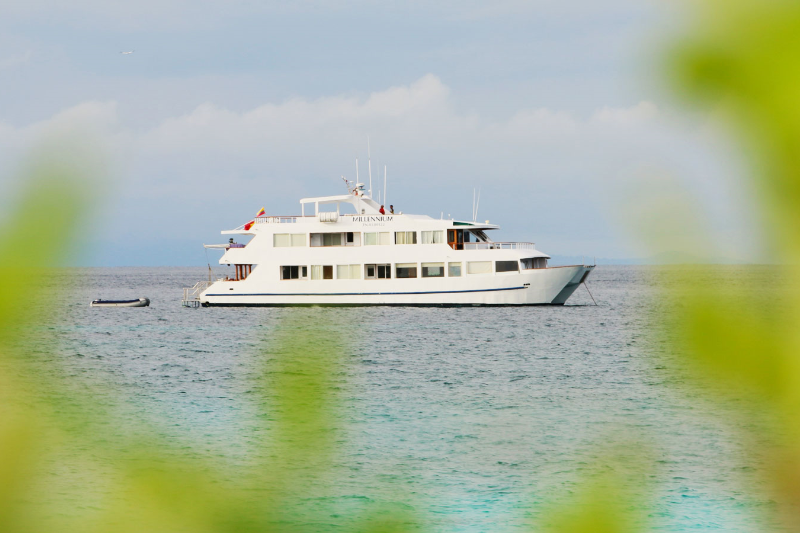 Although most Galapagos cruise boats do not stop here, it is a good starting point for land-based tours. The narrow Bolivar Channel that runs between Isabela and Fernandina Island is one of the best places to see whales such as Bryde’s whale and, reasonably frequently, Orcas or killer whales. Pods of bottle-nose dolphins can usually be relied on to put on a display for passing boats. 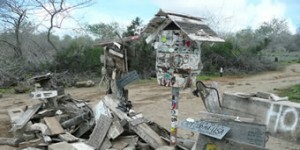 The island offers many fascinating landing points. Tagus Cove was for 300 years an anchorage favoured by pirates and whalers and is now a superb spot for snorkelling. The interesting results of more volcanic activity can be found at Urbina Bay where in 1954, a strip of Isabela’s west coast rose some 16 feet leaving much marine life stranded half a mile inland when the new coastline was formed. The islets of nearby Elizabeth Bay are visited by panga as this is really the only way to explore the red, black and white mangroves, which are home to many species of birds, mammals and marine life. In May 2005, a huge Volcán la Cumbre explosion sent a column of ash and water vapour some 23,000 feet into the air. The volcano has continued to erupt since April 2009. The volcanic activity makes for a tough and unforgiving environment and so, in the main, wildlife tends to be confined to the coastal edges of the island. 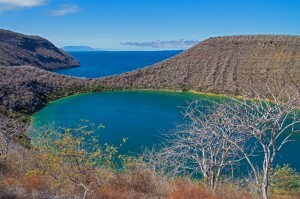 It has also meant that Fernandina is one of the most pristine environments in the Galapagos as, unlike other islands, no introduced species has ever been able to establish itself here. An intriguing stop on any Galapagos cruise, the landing at Punta Espinoza, formed by lava flows from the 2005 explosion, is made all the more dramatic by the almost prehistoric sight of the world's biggest colony of large marine iguanas basking on the jagged rocks as they warm up in the morning sun. Trails take you past various pioneer plants such as the Brachycerus or lava cactus and, whilst it might be barren, the intricate patterns found in the black lava are starkly beautiful. If the fine stands of white mangroves that have grown up around the tidal pools look vaguely familiar, it may be because the island has featured in numerous films, most famously perhaps Master & Commander. San Salvador has suffered from the introduction of non-endemic species such as pigs, goats, donkeys and black rats and these now feral populations have had a serious impact on the natural, endemic flora and fauna. 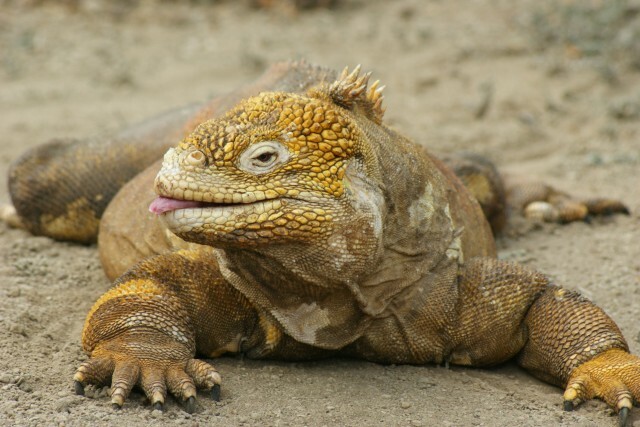 Eradication programs that began in the 1970’s have had some success – particularly with goats and pigs, but this was too late for land iguanas, which are no longer found on the island. 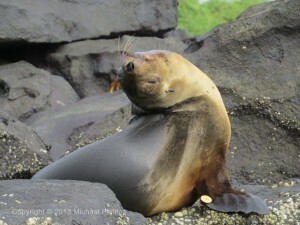 Arriving by Galapagos cruise or by land tour, you will want to see the most popular visitor destinations on San Salvador which are the old pirate bases of Buccaneer Cove and Puerto Egas: interesting for its black sand beach and the picturesque lava tubes that Galapagos sea lions and fur seals squabble over in the search for the perfect basking spot. Bahía Sullivan sits on the edge of a large, rather desolate yet fascinating lava flow. 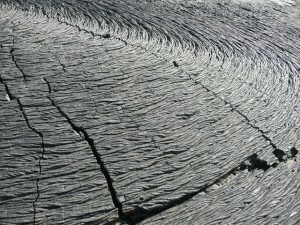 Intricate patterns have formed in the pahoehoe lava, and the moulds of trees vaporised by the heat can be seen in the flow, some of which was formed as recently as 1900. 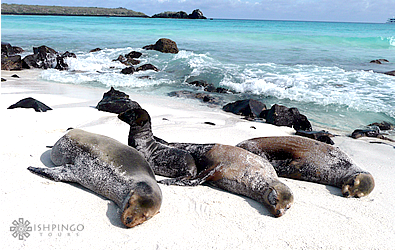 Playa Espumilla, by contrast, is a stretch of golden sand that is frequented by nesting green sea turtles, waders and many Galapagos sea lions. Snorkelling is good in the clear water, particularly around the collapsed lava tubes at Puerto Egas, with a wide variety of tropical fish to be seen together with moray eels, shark and octopus. Separated from Baltra by a short, narrow channel, North Seymour is an uplifted lava flow that has formed a plateau of only 1.9 square kilometres. Though small, the island offers a good introduction to the unique plants and animals that can be found on the archipelago. 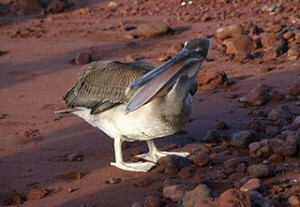 It is here on your Galapagos cruise that you might first witness the piratical behaviour of the frigate birds: dive-bombing and harassing other birds into dropping food or nest building materials before swooping and snatching up the booty in their own beaks. An interesting circular trail takes you through the low, bushy vegetation so suited to the island's desert-like climate. Endemic plants such as the dwarf Palo Santo and the strikingly shaped opuntias form the backdrop to the constant cycle of mating, nesting and chick rearing. Endearingly comic blue-footed boobies are never more than an arms length away. Mosquera Islet is a small islet created by an uplift of sand. It is located between the islands of Baltra and North Seymour, and is made up of rocks and coral reefs. This island boasts one of the largest sea lion colonies in the archipelago and also many shorebirds live here. Occasionally, Orcas have been seen preying on sea lions in this area. A Galapagos cruise is a great way to see these sights. Your tour ends on Baltra at the first ecological airport in the world designed to reduce impact through energy saving programs, rain water recovery systems and extensive recycling. 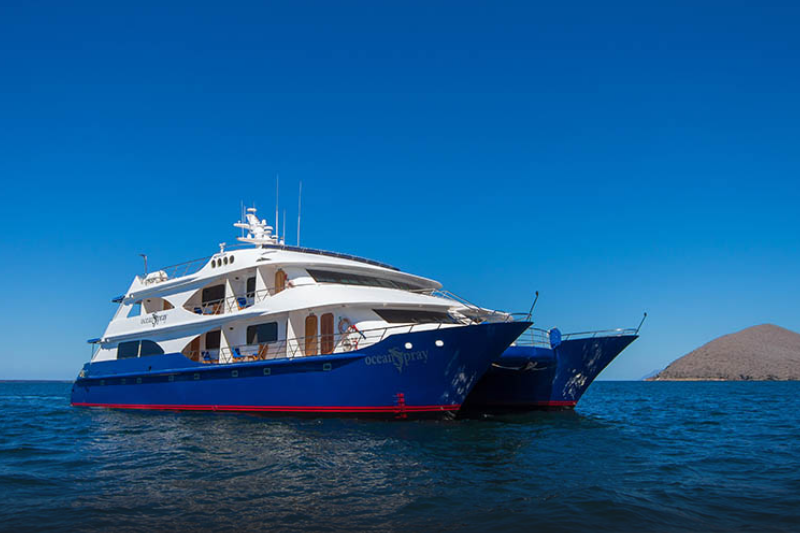 Most Galapagos cruise boats anchor in Bahía Darwin, a 2.5km-wide natural harbour formed by the collapse of a volcanic caldera. Famous for its many species of birds, including the world’s largest colony of red-footed boobies, the island is a paradise for birdwatchers. Even from the vantage point of the boats' decks, you will see an impressive array of activity: from thermal riding great frigatebirds to red-billed tropicbirds returning to their cliff-based nests. Walks take visitors alongside a white sand coral beach, through winding mangroves to turquoise tidal pools. Another option is to climb the steep, rough-hewn cliff steps known as El Barranco(and also Prince Phillip’s Steps) to follow a path through busy seabird colonies to a forest of Palo Santo. This fragrant tree, found along the coast of South America, is used to produce incense and sweet essential oil and is a member of the same family as frankincense and myrrh. At the end of the path is revealed the highly impressive sight of over 200,000 pairs of Galapagos storm-petrels seemingly all flying at the same time. The clear waters around the island make for some excellent snorkelling opportunities where, amongst shoals of exotic tropical fish, you might also spot stingrays and white-tipped reef sharks. 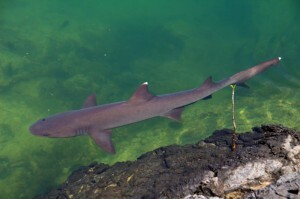 In deeper waters, hammerheads and Galapagos sharks are also often seen. Bartolomé, a favourite stop on any Galapagos cruise passing through this part of the archipelago, is formed by two cinder cones joined by an idyllic, lush green isthmus fringed by storybook-like golden beaches. It is around here that most of the wildlife is to be found, the rest of the island being too harsh an environment for all but the most pioneering and hardy of species. The impressive panoramic vista of the surrounding bays and islands is probably one of the best in the Galapagos and makes the 114m climb to the summit of the island well worth the effort. The top is reached via a wooden boardwalk designed to protect the fragile lava from the feet of enthusiastic visitors. The surreal, Mars-like landscape of lava tunnels and spatter cones is broken only by early colonisers such as matplants, lava cacti and the lava lizards that dart over the red-brown surface of the volcano. Back down at sea level, good visibility means that excellent snorkelling is to be found in the two bays while a gentle panga ride around the foot of the rocks often affords great opportunities to watch the endearing behaviour of the world’s only tropical penguin – the Galapagos penguin. Rábida Island bears the name of the convent of Rábida, where Columbus left his son during his voyage to the Americas. It has an area of 4.9 square km and a maximum altitude of 367m. The high amount of iron contained in the lava at Rábida gives it a distinctive red colour. White-cheeked pintail ducks live in a saltwater lagoon close to the beach, where brown pelicans and boobies have built their nests. Until recently, flamingos were also found in the lagoon, but they have since moved on to other islands, likely due to a lack of food on Rábida. Nine species of finches have been reported on this island. Many of the Galapagos cruises drop anchor in the narrow channel that runs between North and South Plaza, usually close enough to the cliffs of North Plaza to allow for views of the busy seabird activity there. South Plaza is reached by a short panga ride to the island's flat northern edge where sea lions take command of the landing jetty. A large population of land iguanas roam over the confined space feeding on the carpets of succulent sesuvium and the distinctive opuntias that are abundant on the island. The 25m-high cliffs that rise on the southern edge of the island offer an excellent vantage point from which to watch the great variety of seabirds that take full advantage of the abundant nesting sites afforded by the lava’s many crevices and ledges. Eye level aerobatic displays by piratical magnificent frigate birds, Audubon’s shearwaters and red-billed tropicbirds at times seem too close for comfort. 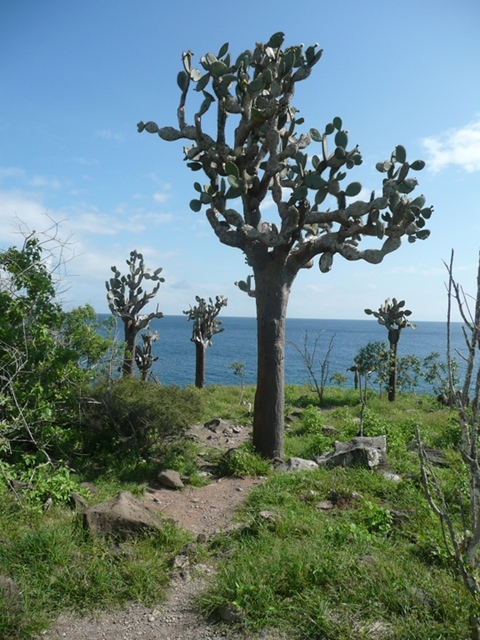 This island is a special treat available on various Galapagos cruises. 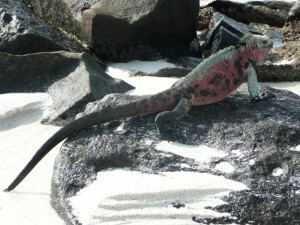 The age and isolation of Santa Fé has allowed a number of endemic animals to evolve including the Santa Fé rice rat, gecko and Barrington land iguana. 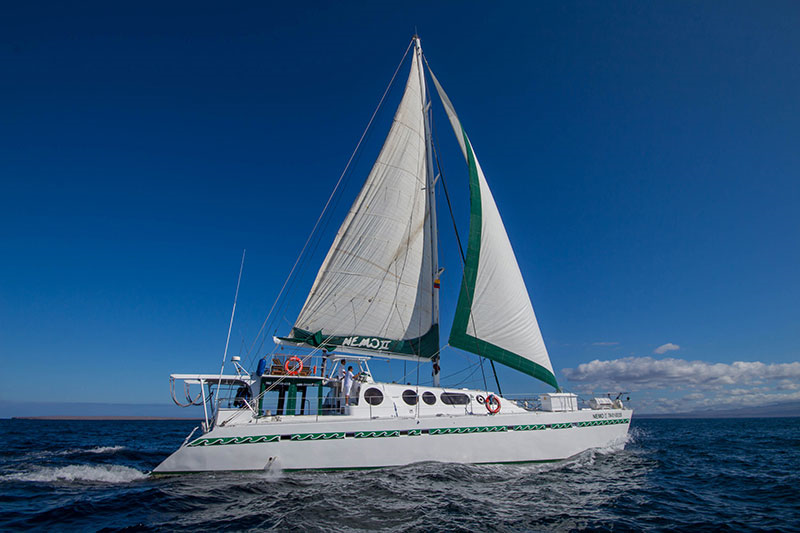 Many of the Galapagos cruises anchor in the tranquil and idyllic turquoise waters of Barrington Bay, which is the island's only visitor site. The fine white sand beaches are home to many dozing sea lions, particularly juveniles that like nothing better than to frolic with the snorkelers exploring the bay’s varied and extensive marine life. There are some lovely trails up through the giant Optunia forest with many good wildlife viewing opportunities. There is a history on Española of highly successful programmes to restore the population of the Hood giant tortoise rescued from the brink of extinction and the opuntia cactus on which the tortoises feed, but which were at one time lost to grazing goats. Española is special for a number of reasons, but it is a particularly important Galapagos cruise stop from March to December, as it plays host to nearly all of the world’s giant waved albatross population that come here to breed. Visitors’ arrival at Punta Suárez is greeted by dozens of sea lions relaxing on the beach and the spectacularly coloured marine iguanas that bask in the sun to regain their optimum body temperature. 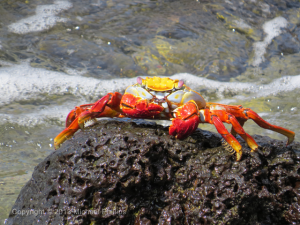 Their reds, greens, pinks and turquoise, are perhaps only matched by the equally colourful scarlet and blue of the plentiful sally lightfoot crabs that scuttle about the rocks and pools. The trail continues amidst superb scenery to a dramatic blowhole that, depending on the tide, shoots spray some 25 metres up into the air. 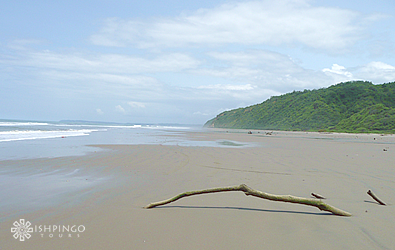 The second landing point on Española is Gardner Bay, which has one of the longest beaches in the Galapagos. The 2 kilometres of white coral sand meeting with turquoise coloured sea is an enticing place on which to relax and simply watch the local inhabitants pass by. Those drawn to the water will be rewarded by an opportunity to swim with the ever-playful juvenile sea lions. For up-to-the-minute rates & special promotions, please contact us. All rates will be quoted per person based on double occupancy unless otherwise specified. Due to the design of this boat, no Single supplement: applies (subject to availbaility). Vendors and agents in the travel industry quote package-deal and accommodation prices in terms of dollars per person when the customer travels in a group of two, that is, "twin share" or "double". The single supplement is a premium surcharge applied to a traveller who travels alone but will use a room that caters for two. Copyright © Ishpingo Tours , a division of Andando Tours Cía. Ltda. Note: We do our best to ensure that all information is accurate at the time of publication, but things change, so do check ahead. Enjoy your travels!